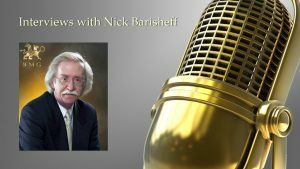 Nick Barisheff of Bullion Management Group Inc. (BMG) notes that most of the above ground silver stockpiles were sold before the year 2000 and each ounce at the COMEX has 44 eligible owners. Moreover, only 20% of silver is the byproduct of pure silver mines, the remaining 80% is derived from base metal production, such as lead. The net result: 50% of silver demand is industrial in nature with unique nearly vertical asymptote-like demand / supply curves, which makes demand indifferent to increases in price. Put simply, no matter how costly silver becomes, industrial demand for items like solar panels and laptops / iPhones / Androids remains constant as there are no economical alternatives. Consequently, even if jewelry demand were to drop to near 0%, the remaining 50% industrial demand holds constant. 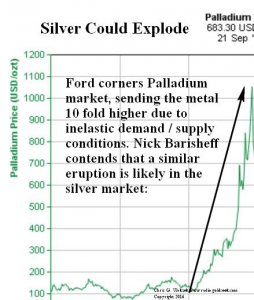 Case in point, when Ford purchased $2 billion of palladium, a precious metal with similar industrial qualities the price leaped 10 fold (Figure 1.1). Until the 2011 gold zenith, the trend in US debt and the price of gold tended to walk in lock step, in near perfect correlation. If the relationship were to return, it would require a price of $3,000 gold to reflect today’s debt levels and using Professor Lawrence Kotlikoff’s $200 trillion debt figure, $30,000 gold. Nick makes the chilling claim – one day in the not so distant future, investors will notice gold is $2,000-$3,000 higher than the day before and it will be too late to procure discounted PMs. When Ford Motors purchased $2 billion of palladium, a precious metal with similar industrial qualities the price leaped 10 fold (Figure 1.1). Using Professor Lawrence Kotlikoff’s $200 trillion debt figure, $30,000 gold. Figure 1.1. Palladium Squeeze – Is Silver Next?